The RAFAUT group has been involved for over 50 years in aerospace and weaponry either as an equipment supplier to French Ministry of Defense and as a supplier to the civilian aeronautics major primes. Founded in early 1940 as a mechanics subcontractor, the Company was taken over in 1960 by Jacques Rafaut from his father who leaded it toward aeronautics. RAFAUT runs an in house dedicated design office, which expertise is focused on aerostructural systems that need complex kinematics working in high constraints environments. For civilian aerospace, RAFAUT manufactures flight controls and complex assemblies for civilian aeronautics major primes. Since the end of the 80s, the company has developed an extensive line of twin bomb racks (AUF2) fitted to different aircraft, up to MIRAGE 2000. 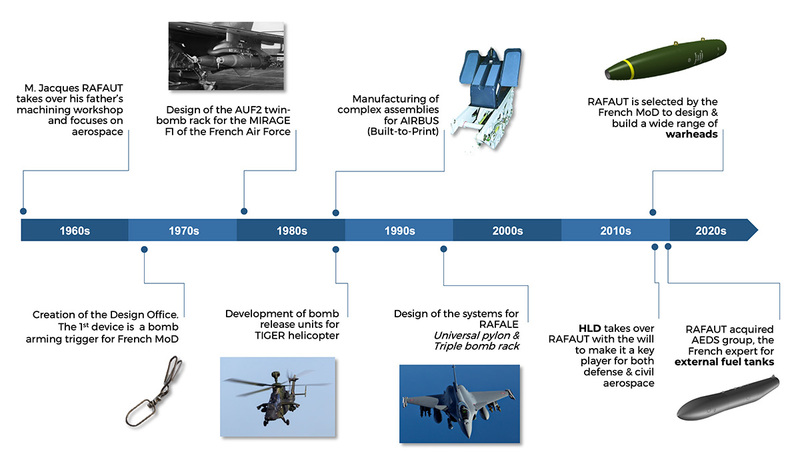 Based upon this experience, the French MoD (DGA) selected our company to develop and produce a triple store rack dedicated to the RAFALE (AT730), coming along with the RAFALE wing station 2 pylon (PU708). As a civilian parts manufacturer, today RAFAUT company is specialized amongst others in-flight controls whole complex assemblies. Rafaut is proud to provide work packages to AIRBUS, STELIA, AIRBUS HELICOPTERS or SAFRAN. 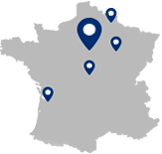 Since 2018, RAFAUT has been to French official supplier for warheads (mk-8x type and penetrators) and external fuel tanks. The RAFAUT group has put in place a dedicated structure to answer the Armed Forces ILS (Integrated Logistics Support) requirements. This organization has been extended to the civilian activities and enables RAFAUT to guarantee a 24h AOG answer. These skills enables RAFAUT group to to deliver “Plug and Fly” products to its customers.